Understand at least two ways that checkpoints/multiple spawn locations benefit player experience. Learn how to use Team Service and Spawn Locations to add multiple checkpoints in the game. As you build your obby, it’s important to think about the design choices you include that make your game fun and interesting to others. Ask students to briefly describe features from the obbies they played before that improved their playing experiences. These may be features that added a level of fun, excitement, or challenge. If your students haven't played many Roblox games, they can reference similar action games like Super Mario or Temple Run. they can Have at least 3 students share one feature. Exciting starting areas with unique themes. Variety of different jump puzzles. Jump puzzles get harder as players go, they don’t start off too difficult. While you can make a long obby, it can be frustrating for a player to get nearly to the end and then fall, losing all their progress. Having multiple spawn locations lets the player re-spawn, or restart, after reaching certain parts of your game, making the game more fun. You may have this common game design tool, sometimes called checkpoints, in games like Super Mario. Before or after a difficult jump. After players have played for a while. Ask students why having multiple spawn locations improves a player's experience. This is an opportunity to discuss good design practices and encourage students to think about how they can affect a player's experience. Players feel good when they beat a level, which keeps them playing. It gives players a sense of progression (like they're growing or improving). They’re like chapters in a book, levels can be used for different parts of a story. Each player has a certain SpawnLocation assigned to them. Every time the player touches a new spawn, the new location replaces their old one. If they fall, they will respawn on the last spawn location they touched. 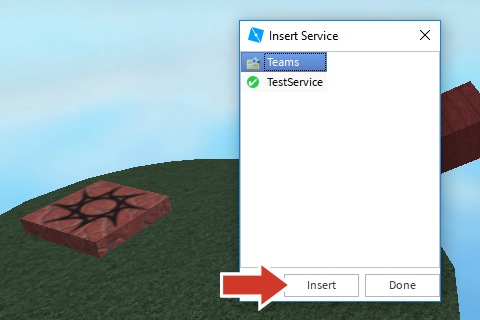 We use a special tool in Roblox called Team Service to create multiple spawn locations. Each team has a unique spawn location assigned to it. When a player changes a team, they change their spawn location. 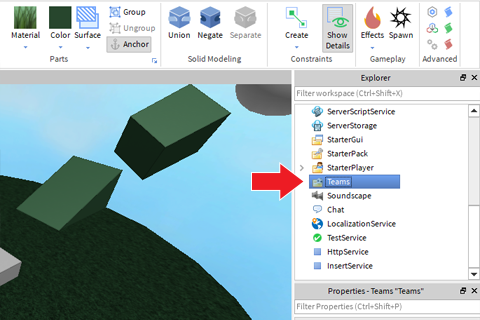 This is an easy way of using Roblox’s built in tools to add multiple spawn locations. In the Advanced section (furthest right), click Service (two cogs). With the Team service added, you can now create teams. Remember, each team that you create will actually be a different spawn location (checkpoint) in your obby. As the player goes through our game, they’ll be switching teams to switch their most recent spawn location. 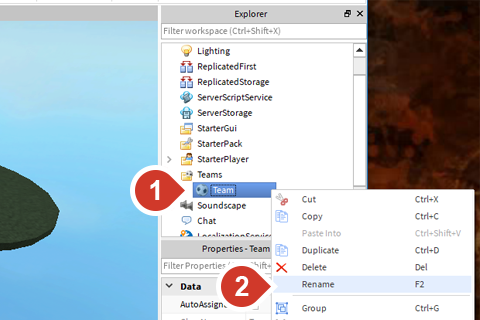 In the Explorer, right-click Teams. Click Insert Object > Team. 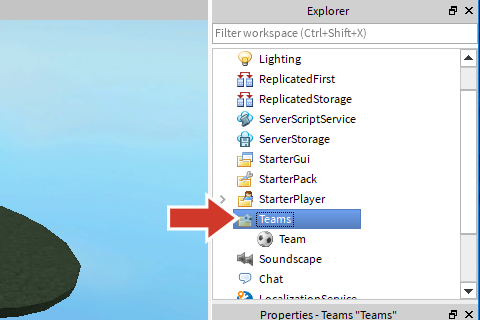 You'll now notice a team is created in the Teams folder. If Team doesn't show up, try restarting the steps. It's possible to accidentally right click the wrong object or not insert the Team service. At the moment, any team can use your original SpawnLocation. While this sounds like a good thing, a player on your 15th spawn location might accidentally respawn at the beginning of the whole game. To fix this possible problem, we need to change the team properties. Click on your starting SpawnLocation. In the Properties window, uncheck Neutral. Now players can only spawn at this SpawnLocation if they match the TeamColor of the SpawnLocation. This will prevent any possible problems we might have in our game. For a team and a SpawnLocation to match up, the Team Color and SpawnLocation need to match exactly. 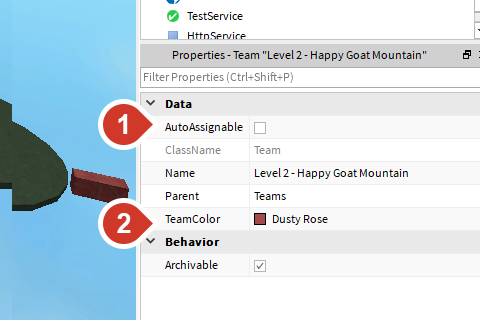 In SpawnLocation Property Window, look for the TeamColor; you’ll need to remember this color. Click on the Team object you renamed. Set the TeamColor to match the first SpawnLocation. Make sure to replace the TeamColor, not the BrickColor of the SpawnLocation. Make sure that the colors match exactly. Now you can start the process of adding more spawn locations to give your player a longer, more interesting experience. Check AllowTeamChangeOnTouch. Now whenever somebody touches the SpawnLocation, they’ll join the matching team color. Create a new Team Object (right-click Teams > Insert Object > Team). Rename it to your level name. E.g. Level 2 - Happy Goat Mountain. 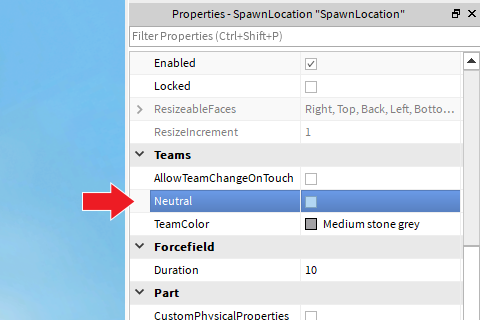 Change TeamColor to match the new SpawnLocation. Only the first Team should be set to AutoAssignable. That way players will automatically be assigned to the first level when they start the game. Add at least 3 new spawn locations. Test after adding each point to check that it works as intended. Use a different team color for each spawn location/team object. Only the first team is set to AutoAssign. The SpawnLocation is marked neutral . 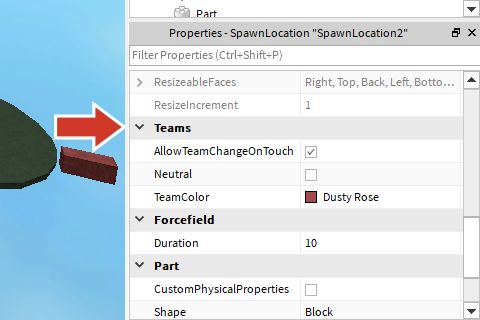 The color matches on the SpawnLocation TeamColor and the Team object TeamColor.